Most people on the Continent have never heard of it. Still, every culture, even the most fine, produces some version of it: pressed meat in a can. Even the Italians have their own version: Simmenthal (which is shredded and encased in aspic rather than pressed, and tastes much better than it sounds). The British, of course, have their famous corned beef, which can be purchased in a can in a tin. Perhaps the French are above such things, but somehow I’m sure they have their own version as well (well, of course they have their tins of fine pâté that go for €50 a pop, but I’m talking about the kind of tinned (or canned if you’re American) meat that makes the gourmands out there turn up their noses, so we can’t really include pâté in our list). No, I’m talking about the stuff we Americans know as SPAM. 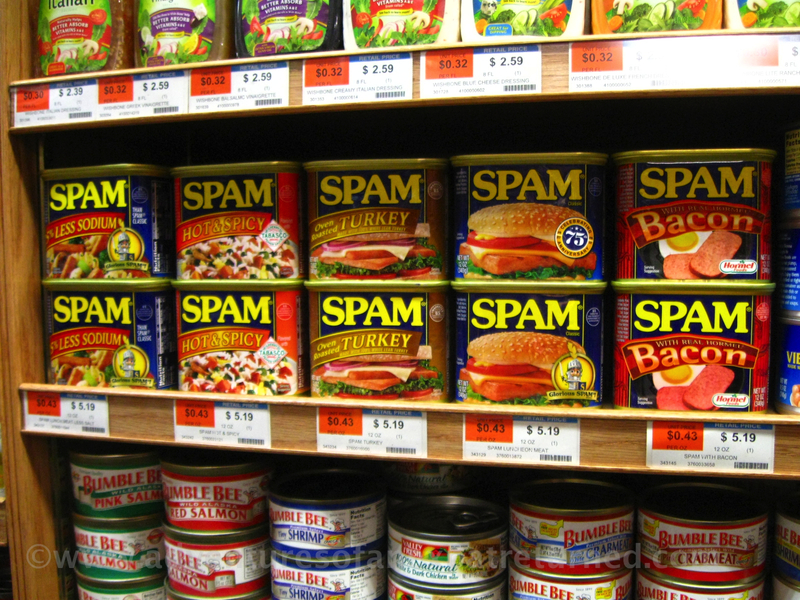 It’s the stuff that was used as rations during WWII (and, to this day, remains a kind of regional delicacy in Hawaii as a result… yes, there is such a thing as Spam salad, Spam pizza…). All these years I’ve been under the impression that Spam was, simply, Spam. Au contraire! However, I had to go to an NYC deli on the Lower East Side to discover that this historically (and often affectionately) maligned American delicacy food item has branched out quite a bit since the 1940s. Who would have guessed? If you’ve been worrying that food might get boring after a hypothetical ice-age/nuclear/zombie/asteroid-provoked apocalypse, you can breathe a sigh of relief. The good old Spam company has ensured that we will not lack for variety for quite a few decades after the end of the world as we know it. Can man live on Spam alone? Perhaps it’s not so far-fetched of an idea after all (well, provided the man in question isn’t a vegetarian). Thanks for coming along to NYC! I saw a whole lot more than Spam on a shelf, but let’s take things one at a time. There will be more NY adventures coming soon. This entry was posted in Glorious Food!, In Jest and tagged Food, Hawaii, New York City, SPAM, United States. Bookmark the permalink.